Update 5th August 2013 – Woo have made an update to their original announcement – if you want your lifetime license to continue you have 24 months to log into your Woo control panel and request re-instatement of your original terms. This is good for Woo, as after 24 months they will know their exposure to support requests. ‘Legally’ this is bordering on a grey area, but I say tough luck, if you’ve not logged into your account in two years then it’s unlikely you’ll still be using Woo products. Hopefully Woo don’t start ‘retiring’ products faster than they would otherwise – time will tell. Yes that’s right, WooThemes, the popular WordPress Framework provider located in Cape Town South Africa, has broken the contract with up to 100,000 of it’s current client-base! Woo they took it upon themselves to cancel the contract with prior Customers and implement new terms and conditions – retrospectively. These new ‘terms’ increase the cost considerably, put restrictions on the support of products, and for customers that purchased frameworks outright with no further costs … now charge them a yearly fee. Woo claim that they need to have a sustainable business model – well they’ve failed on that point as they’ve left themselves wide open to legal challenge as they’ve retrospectively tried to change the contract with existing customers. That’s not very sustainable is it? What did they change, well they changed a bunch of things, but the thing that has caused the biggest gripe with us, they’re taking away the service that we paid for. Back in 2012 we purchased a suite of themes and frameworks at a one-off cost. Updates and support are included as part of the package, and for life. Woo are retrospectively trying to cancel this contract, with no basis in the terms and conditions to do so. Why did WooThemes do it? So why did they do this – Woo they decided they wanted more cash in the bank to cover the cost of support tickets. Here’s the thing, along with many other developers have never raised a ticket. If I’ve had a problem – I’ve looked at the code and figured it out myself. It’s not tough and we’ve made some fantastic websites with the products from WooThemes. What Woo have done is known as Bait & Switch, and it is illegal in most developed countries, including South Africa which has draconian laws protecting Consumers and Business. So Woo enticed us with price and a set of condition, then changed EVERYTHING to the detriment of the existing Customers. 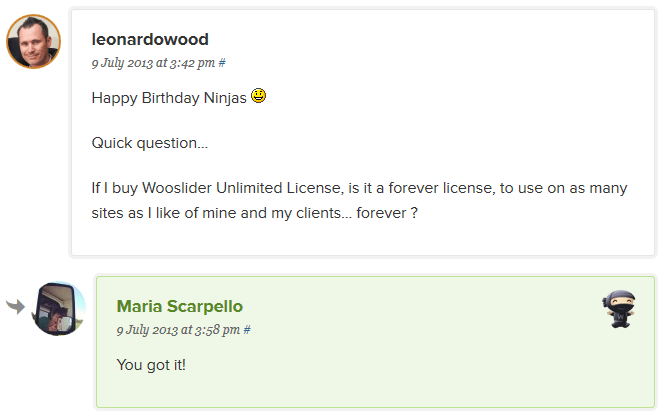 An example less than a month ago from WooThemes, on their 5 Year Birthday Woo offered discounts, and leonardowood asked Woo to confirm if the license is forever – Woo confirmed it was … but that ‘forever’ licence was cancelled by Woo after less than a month! Thanks to Jacqui for this example ( click for larger). Now Woo want folks to pay a yearly subscription in addition to the purchase cost which already included lifetime support. In the comments of their blog posts it is reported that some existing customers will now end up spending $14,000 per year in addition to the fees they have already paid … this is just crazy money. It’s going to put a bunch of smaller developers out of business. Which smaller developer can find and justify a spare $14,000 on the whim of a supplier? Not us. Remember when the BMW introduced the new Mini, BMW they offered 3 years servicing for just £100. Imagine if BMW then decided, forget it, we’re keeping the £100 and you can pay for the servicing yourself! This is the same. Actually it’s worse, I can think of some very good use for $14,000 a year … I’m not in that position thankfully, and our current exposure is limited to a three figure sum, but that’s three figure sum is for something that we’ve already paid for. And that’s where the math goes wrong: we’ve made a loss of $170 ($70 minus $240) on your purchase, and you’ve made $48k. That’s a bit like Ford asking for a percentage of my salary each time I drive to work! No that doesn’t wash WooThemes – I’ve purchased a Product & Service and you need to stick to your end of the deal. No longer developing WooThemes Sites! Yep that’s right, we’re no longer developing new sites using Woo’s Framework whilst this uncertainty continues. What next, WooThemes asking for even more money from me and additional hikes in cost? When our current projects are complete, we’ll be moving to a different framework. Actually I lie, money has exchanged hands and we’ve are will be developing new sites under the Genesis framework. My thanks to the fab team at StudioPress for cutting us a great deal as a WooThemes refugee. That said, we’ll update our WooThemes Canvas CSS Tweaks page later this month, we’ve got a BUCKET load of tweaks to add – and you’ll LOVE them to pieces. We do hope Woo change their mind and stop this silliness and we can develop under Woo and under Genesis. Don’t panic – we’ve got you covered. Our exposure is limited to a three figure annual sum – for our clients with a 5 year fixed price support contract, there is no change. Sadly renewals will need to increase once your 5 year term has expired, in the meantime we’ll swallow the cost of the increase. Unlike WooThemes, we don’t shaft our client base! Woo should have Grandfathered existing clients, and start charging for support queries that are not due to errors in their product. ‘Lifetime support’ doesn’t provide a carte blanche opportunity to ask for help in customisation – and they need to sort this out. A sustainable business model is not one where you illegally terminate the contract with 100,000 of your existing customers. The only sustainable business model is for the lawyers should Woo’s customers decide to start a class action. An action which customers cannot lose. Additionally Woo really need to sort their framework documentation, although it has improved during the first half of 2013, in my opinion it is till incomplete and lower quality than other providers. Despite all of this we never raised any Tickets with Woo and our only query was to ask where the documentation on their website have moved to after they changed knowledgeablebase providers. The next few weeks will be interesting. Woo doesn’t have a leg to stand on, either legally (Contract Law is very tough in South Africa where Woo is based) and they have alienated a high percentage of their customer base. Will Woo survive? I really do hope so, they have got some good, mature products. They need to find the same maturity in their sales leadership, this isn’t the first time that Woo have caused resentment with their changes. Woo need to sort out their business model & regain + retain trust from the WordPress Community. I still love Woo – I’d hate this trial separation to become permanent. If you have a comment, please leave it below as Woo have closed & locked the comments on their own Blog post. As Woo have not communicated this news to their customers by email please Share or Tweet this information – thank you! Nice article. You have taken a good step for your clients. It is nice to see such honest approach by a design company. Hi Matt, thank you for your comment. Say to out clients, “Sorry but that contract we have goes in the trash as our supplier has screwed us? Give us more money.”. Is that acceptable? No of course it isn’t … we’d never get another client. I think you are taking the situation very graciously considering Woo didn’t care about you or your business when they took this decision. Their comment section speaks to the truth on how they value their customers – the lack of respect is on display for all to see. Hi Jacqui … thank you for posting. I had not seen that comment … and thank you for sharing. That is totally unbelievable, the contempt that is shown is, well, totally off the scale. I recommend that anyone reading this comment takes a look at the link you posted and makes their own mind up on whether Woo’s conduct is acceptable. I’ve seen a bunch of folks defending Woo over this debacle, and seriously, they must be a few sandwiches short of a picnic if they believe Woo is handling this professionally. My post only scratches the surface of what’s going on with Woo – I had to go at 10am this morning to take my soon-to-be 7 year old out for Day 1 of his birthday treat, and I’m not going to let anyone or anything ruin that! EDIT: I’ve updated the post to include this example – thank you! I can’t tell you how much of a breath of fresh air it is to see articles such as this. Many that originally cropped up were “people are just complaining about woo price increases” and they didn’t take the time to find out what the real issue was. It’s great that you’re taking the right road for your customers. I have also suspended all projects that were being developed on the Woo Framework pending their next blog post regarding this issue. I wouldn’t hold my breath for the outcome being anything good because a few hours ago Woo was seen on twitter citing a screenshot (http://cld.wthms.co/XIRp), trying to defend their actions, which stated they were allowed to change current terms and conditions without warning. Hi Amber, thank you for taking the time to respond. Please do share the post online if you can as the majority of Woo’s customers have yet to be informed of this change. Woo are welcome to change their Terms and Conditions as much as they like, I have very similar wording in my terms. The of the matter is, the change they have made & proposed is unlawful in most developed nations as they are unfair changes to contract terms. It seems like slowly but surely, over the last few days, posts are popping up where people are recognizing what actually occurred and why individuals are so outraged. I encourage people to keep making posts like yours and comments like those of us on WP Tavern. The more people that know the REAL facts behind this train wreck the better. It really puzzles me that many in the WP Community, reputable ones included, are side-stepping the horrenous act of WOO (i.e. renegeding on past contracts, dubious sales practice) and applauding WOO instead. I was all set to agree with their pricing move and thought it was pretty smart until I saw the part about existing lifetime users losing their lifetime status. At best, it’s an unethical move that will at least allow them to keep the fanboys as paying customers while still pulling in new customers to replace the old. At worst, it’s illegal and could make for some hard times ahead for their company. The reason the WP Community/and the reputable ones are side-stepping the change from Woo because either because it is in their interest to support the demise of Woo, or they are totally ignorant of the contractual obligations that Woo has broken. I’d hate to think it’s former, I strongly suspect the latter. The WP Community need to address the ethical, moral, and contractual reasons why this is wrong. I can only say that of I was a Woo employee right now I’d not be sleeping at night. Hi Lisa – agreed, I’d not run a business like that … it’s bonkers! It isn’t the first time they’ve had a ‘wobble’, I really hope it is their last and this is the end of their craziness. If they’d handled it the way they did today in the first place then everything would have been wonderful from the outset. I’ll continue to develop Woo based sites but I’ll be also using StudioPress Genesis … I can’t afford to put all my eggs in one basket. This is extremely worrying for me. Ive been with woo from very early days, I must say I have not liked the way that they have changed terms recently. I will reserve other comments until later when I have a clear head, and not shellshocked! Yes they went a bit crazy didn’t they 😀 Hopefully that’s the end of the silliness and we can all get back to making websites! Well, I guess that as the theme’s and plugin’s licenses are GPL 3, someone could redistribute their themes and plugins for free and offer support for money on a per-ticket basis. Hi Nicole good luck (I’ve added a direct link to your post) and please drop me an email if you’d like any reviews! I saw the change in licensing, but they still grandfather purchases to lifetime support and upgrades made before August 2013. You can read that in the FAQ’s at http://www.woothemes.com/frequently-asked-questions/#license-1. Hi Tom, thank you for the update and link to the new FAQ. This post was originally written prior to Woo backtracking on the ‘2 year’ grandfathering they had originally offered existing purchasers of themes at the start of August. Specifically, that we’ve now capped support and updates for 2 years on any purchase before the 1st of August. After pressure from existing customers and blog posts like this one, Woo backtracked and reinstated the original purchase terms. Well, I’m glad they changed their mind. I really do like the Canvas theme. It’s one of the best customizable themes out there. I am very glad too. Woothemes should have never behaved the way they did!